Chiefs of South Korea’s three biggest conglomerates -- Samsung, SK and LG, in order -- will join President Moon Jae-in’s visit to Pyongyang on Tuesday as part of the 52-member presidential business delegation for the third inter-Korean talks this year, Cheong Wa Dae confirmed Sunday. According to the announcement, the list of business delegates includes Samsung Electronics Vice Chairman Lee Jae-yong, SK Group Chairman Chey Tae-won and LG Group Chairman Koo Kwang-mo, all of whom hold absolute authority to make investment decisions for their respective groups. Cheong Wa Dae had also invited Chung Eui-sun, executive vice chairman and heir apparent of Hyundai Motor Group, but Chung cited a scheduled meeting with US Commerce Secretary Wilbur Ross and other major business issues, Cheong Wa Dae said. Instead, Kim Yong-hwan, vice chairman of Hyundai Motor Company, will be part of the delegation. For the 2000 and 2007 summits, Samsung Electronics’ then-CEO Yun Jong-yong had accompanied former presidents Kim Dae jung and Roh Moo-hyun, respectively. In 2007, SK Chairman Chey Tae-won, LG Chairman Koo Bon-moo, Hyundai Motor Chairman Chung Mong-koo and Hyundai Group Chairwoman Hyun Jeong-eun visited Pyongyang. It is the first time that a member of the ownership family of Samsung, the country’s top conglomerate, will head to the North. 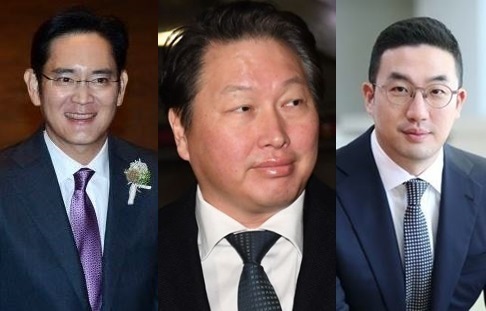 Other business delegates of the 2018 summit include: Hyundai Group’s Hyun; Choi Jeong-woo, chairman of Posco; SoCar CEO Lee Jae-woong; Shin Han-yong, chairman of the Corporate Association of Kaesong Industrial Complex; Oh Young-sik, president of Korea Railroad Corporation; Ahn Young-bae, president of Korea Tourism Organization; Kim Jong-gap, president of Korea Electric Power Corporation; and Lee Dong-geol, chairman of Korea Development Bank.